Semi truck crash causes mayhem at an intersection! Semi truck crash that came a bit unexpected. Let’s be honest; when in traffic we all tend to be somewhat impatient. We want to reach our destination as fast as we can, without all the “drawbacks” like waiting in line at the traffic light. Sometimes when we see that it’s safe we allow ourselves to break the rules just a little bit and be on our way. Nevertheless, this guy took that and brought it on another level; or so it seems. The driver may have not noticed the oncoming truck or he just wasn’t thinking clearly. Whatever the reason was, the crash was not a joke. 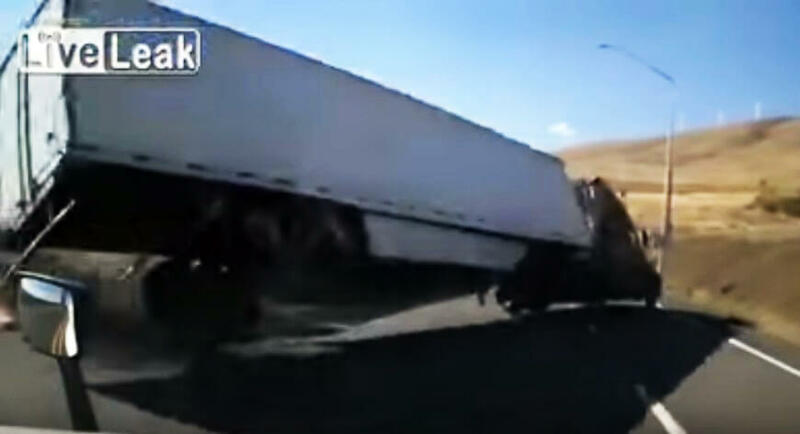 The most scariest thing in this Semi truck crash situation is the fact that the guy is actually driving a semi truck. That vehicle is big and heavy and can do a lot of damage even with making the slightest mistake. Well, just like he did. The driver that caused this semi truck crash didn’t wait for the other truck to pass the intersection so, he took matters in his own hands. Instead of waiting for approaching traffic to pass, he turned at the intersection which made the truck leave the ground for a second. The trucks crashed hard and luckily, nobody sustained serious injuries. Semi truck crash video below!